Victor Borge was a combination pianist-comic who filled my childhood with laughter. I was thinking about this quote and how it relates to mindfulness. When we are living in the present moment we are free and flexible. Our openness allows us the opportunity to see spontaneous humor in life and respond to the little moments in life with wisdom, humor, and kindness. I had a moment with this the other day. I recently accepted a job back in the music classroom. I was moving things into my new classroom when I saw a little boy (perhaps 2nd grade) hop out of the window on the ground floor to go to the playground. Don’t get too worried, it was a 4 foot drop, at the most, and it was after school. The kiddo cleared that window ledge with amazing agility! He landed directly in front of me and his face showed that he was certainly not expecting to see an adult standing there. Earlier that day I noticed that I was rushing around. I made a mental note to practice mindful walking from the school door to my portable classroom outside. This little incident happened as I was really dropping into the present moment. It gave me freedom. Instead of yelling at him and dragging him to the office, I felt something different. Something inside tugged and gave me a different response. Instead, I was able to ask a gentle question, “is that a safe way to exit the classroom?” He clearly was thrown at my lack of yelling. After a moment or two, he said no, and I asked him to please go back inside and exit the classroom safely. He was relieved, we smiled, and we introduced ourselves to each other. He assured me that jumping out of the window wouldn’t happen again. Here’s the thing. The same result happened as would have happened had I gotten mad at him and been “mean” about it. I think it’s important to think through our responses to things to see how we can get to the same end but using the freedom and spontaneity that mindfulness gives us. In my opinion, this is where the practice of ahimsa happens. So, today, as we encounter people and situations, let us practice mindfulness to appreciate the kind spontaneity that can permeate our day! Categories: mindfulness | Tags: Ahimsa, be at ease, meditation, mindfulness, teaching, yoga | Permalink. 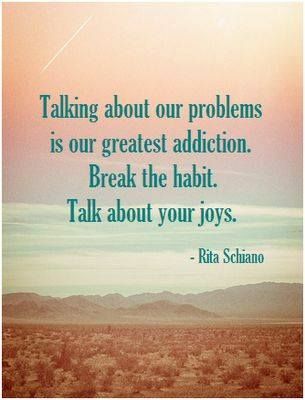 Complaining-Mind: Take 3 and Counting your Joys! Earlier this week, I wrote about complaining. In the first post, I talked about how complaining allows us to live with a victim mentality. I challenged us all to notice complaining-mind, let go, and shed the victim role. The next day, I posted about how I had a really hard time letting go of complaining. I noticed that each time I complained in my head, I would reinforce that complaining story with more thoughts. I challenged us all to notice complaining thoughts and stop feeding them. I am happy to report that yesterday felt better than the day before. This is not to say that I didn’t notice complaining thoughts. On the contrary, I noticed the same complaining thoughts (and some new ones), but I really tried to stick with my intention of NOT feeding those thoughts and stories. I have a feeling that this might be a long journey for me, but I’m ready for it. I really want to cultivate more gratitude in my life. So, I will continue down this road with working with complaining mind. As I do that, I’m adding another layer. When I notice complaining mind, I intend to stop feeding it, and instead focus on my joys. Will you join me in Today’s Opportunity for Mindfulness? Today, when you notice yourself complaining about something, shift your focus and name a joy. This does not mean that you shut down and ignore true problems or situations that you need to talk about or address with someone. This is more for little complaints and problems that are not really worth complaining about. I think we all can intuit the difference. Categories: mindfulness | Tags: be at ease, count your blessings, count your joys, mindful living, mindfulness, stop complaining, yoga | Permalink.